In the same way as it is possible in the everyday world to get big rolling waves in the sea with tiny ripples superimposed on them, it is also possible in the sub-atomic world for a combination or superposition of waves to exist. Schrödinger’s theory of probability waves permits the existence of two or more waves. In the example from the previous section of light shining on an imperfectly transparent sheet of glass, one wave would correspond to a photon passing through the glass and another wave would correspond to the photon bouncing back. But it is also possible for both waves to have superposed waves, which leads to the possibility of the photon being both transmitted AND reflected, and therefore being on both sides of the glass simultaneously! In fact, this leads to the possibility of a potentially unlimited number of superposed waves, which means that microscopic particles can theoretically be located in a potentially unlimited number of places at once, and to behave in a potentially unlimited number of different ways. Just one of the intriguing possibilities this idea suggests is in the realm of computing, for example, where a "quantum computer" (still largely hypothetical at this time) could take advantage of an atom’s ability to be in a superposition of states to produce prodigiously increased power and speed of calculations. Interestingly, a modern incarnation of Thomas Young’s double-slit experiment using a very feeble light source that spits out one photon at a time, leads to the same evidence of interference, even though there are no waves as such to interfere with each other. 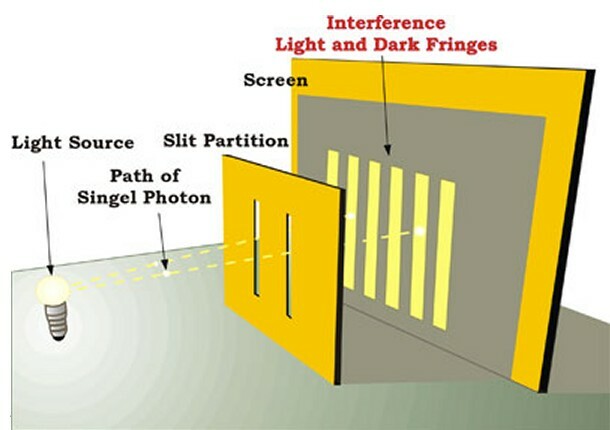 The only way the single photons can experience interference, then, is if each photon somehow goes through both slits simultaneously (due to superposition) and interferes with itself! The entire experiment can in fact be performed with electrons, atoms or other sub-atomic particles instead of light, demonstrating that ALL particles manifest both wave and particle aspects (this interference is the mechanism by which a hypothetical quantum computer would combine its multiple calculations into one answer). In 1978, John Wheeler proposed a variation of Young’s double-slit experiment (and Richard Feynman’s later refinements of it), often referred to as the "delayed choice” experiment. He posited that the detection of a photon even AFTER passing through a double slit would be sufficient to change the outcome of the experiment and the behavior of the photon. Therefore, if the experimenters know which slit it goes through, the photon will behave as a particle, rather than as a wave with its associated interference behavior. This somewhat counter-intuitive hypothesis was finally verified in a practical experiment in 2007. It should be noted that, in reality, superpositions can never actually be observed - all we can see is the consequences of their existence, after individual waves of a superposition interfere with each other. Thus, we can never observe an atom in its indeterminate state, or being in two places at once, only the resulting consequences, and physical reality is not determined until the act of measurement takes place and “solidifies” the situation into one state or another. Part of the problem of observing and measuring superpositions is known as decoherence. Any attempt to measure or obtain knowledge of quantum superpositions by the outside world (or indeed any kind of interaction with their environment, even with just a single photon) causes them to decohere, effectively destroying the superposition and reducing it to a single location or state, and also destroying the ability of its individual states to interfere with each other. Decoherence, then, results in the collapse of the quantum wave function and the settling of a particle into its observed state under classical physics, its transition from quantum to classical behavior. Decoherence is also the main reason that quantum theory really only applies in practice to the sub-atomic world: in the large-scale world in which we live, it is all but impossible to isolate anything from interaction with its environment, especially given the countless trillions of photons bouncing off every object all the time. Even an object made of just 60 atoms requires extreme cold to prevent it from becoming “classical” rather than "quantum". It is the interaction of quantum objects with the environment that produces what we understand as classical objects, such as cats and tables. Thus, in practice we never observe a quantum system directly; we only observe its effect on its environment. 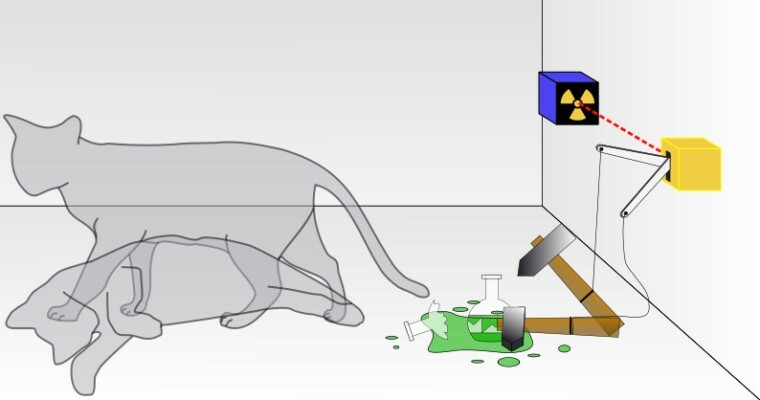 In 1935, the Austrian physicist Erwin Schrödinger devised his famous thought experiment or paradox, known as “Schrödinger’s cat”, to graphically illustrate the problem of decoherence (and to illustrate the general bizarreness of quantum mechanics). He proposed a scenario with a cat in a sealed box, where the cat's life or death was dependent on the state of a particular sub-atomic particle. According to the Copenhagen interpretation, the cat is in a kind of limbo represented by a wave function which contains the possibility that the cat is dead but also the possibility that it is alive. The cat, then, remains both alive AND dead until the box is opened, i.e. a superposition. This is usually taken as a demonstration of the way that quantum physics breaks down when dealing with large objects. Although the best known and most popular view, the Copenhagen interpretation is, however, not the only interpretation of the quantum world. Some scientists, going back to Hugh Everett III in 1957 and subsequently championed by Bryce DeWitt and many others, have hypothesized that each possible state of a superposition actually exists in a totally separate parallel reality, which are all part of a potentially infinite multiverse, the so-called “many worlds” interpretation. Thus, every indeterminism in a quantum system generates a multifoliate reality in which the universe is continually branching into myriads of physically disconnected (but equally real) parallel universes. This view purports to explain many of the apparently inexplicable properties of quantum theory. For example, the experimentally-proven phenomenon whereby individual photons going through a slit mysteriously experience interference, may be explained in the many worlds interpretation by interference from photons in other parallel universes. It may also provide explanations for some of the more intractable problems of the Big Bang theory - for example, see the section on Superstrings and Quantum Gravity. Unlike the Copenhagen interpretation (in which consciousness actually influences reality), the many worlds interpretation requires no observers to shape reality, since it is not necessary to collapse a wave function to actualize the universe, and every reality that CAN conceivably exist is automatically created. On the downside, however, the many worlds hypothesis is about as extravagant as it is possible to get, quite the opposite of the principle of parsimony, often referred to as Occam’s Razor, which dictates that theories should be constructed using the least possible number of principles and assumptions. And, of course, if parallel universes are independent and separate from our own, there is not, and indeed never will be, any way of practically proving their existence. In 1986, John Cramer proposed another alternative interpretation of quantum physics, which many people feel overcomes the drawbacks of both the standard Copenhagen interpretation and the many worlds interpretation, and resolves many quantum paradoxes. Known as the "transactional interpretation", Cramer described quantum interactions as involving both a wave going forwards in time and a wave going backwards in time. According to the transactional interpretation, in any quantum transaction (such as the propagation of an electromagnetic wave between two particles, for example), the receiving particle’s backward wave reinforces the emitting particle’s forward wave so long as it is between the particles, but it cancels out the emitting particle’s own backward wave (which is why a backward wave is not seen before the emission); and the receiving particle’s forward wave also cancels out the emitting particle’s forward wave (which is why a forward wave is not perceived after the receiving particle has absorbed it). Thus, the particles interact in the way called for by quantum physics (including the “collapse of the wave packet”, etc) without requiring an act of measurement by an external observer, allowing for the existence of a "real world" out there independent of us. The interpretation has it critics, but has gained much traction since its initial proposal. There are also many other competing interpretations of quantum theory, including the consistent histories interpretation, the ensemble interpretation, relational quantum mechanics, stochastic mechanics, objective collapse theories, the many minds interpretation, the modal interpretation, and several others. It remains a highly active (and controversial) area of modern physics.